Last year radio aporee asked people around the world to send sound recordings made on July 18, to the radio aporee ::: soundmap project. This was fun and a success. 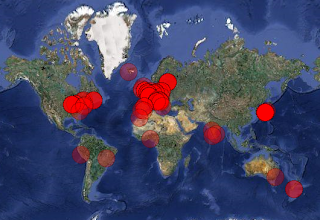 Listen to the amazing results on the project map of the World Listening Day 2010. Send your audio recording to radio aporee to create a sonic snapshot of the world on Monday, July 18, 2011. Please read the info and instructions on how to upload to the soundmap. Additionally, during July 18, radio aporee will provide a broadcast of the 2010 recordings on the radio aporee streaming website. If you want to stream your WLD 2011 event contact radio aporee / udo noll know soon. Visit aporee.org WLD 2011 web page to learn how.